David Hollington has started bringing us miniature portraits. Whenever I see him he pulls another set from his pocket. 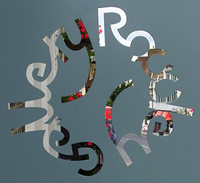 They are like fragments from a larger work, a cast of characters that can interact in any number of different stories. David Hollington will be exhibiting recent paintings at the Penny Fielding Gallery in Walthamstow from 5th September 2013. More information here.